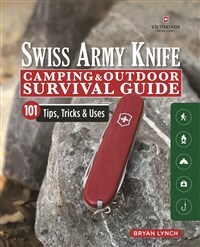 Sharpen your survival skills with the Victorinox Swiss Army® Knife Camping & Outdoor Survival Guide. This handy reference shows how to use the iconic red multi-tool to handle 101 different emergency situations. From starting a fire and making a shelter to catching a fish, building a stove, or applying a splint, discover why the SAK is a must-have for everyday carry. A must read for those looking to get the most from their Victorinox Swiss Army Knife, a perfect addition to any outdoorsman’s toolbox. It would be a great guide to teaching youth or beginner knife safety, usage, and maintenance; as well as giving experienced users some projects to further their skill set. Bryan Lynch regularly publishes articles and gear reviews on SurvivalCache.com, a popular survival information forum with millions of visitors. He also publishes his own survivalist blog CivilizedSurvival.blog, where he shares experiences, reviews, projects, and opinions related to emergency preparedness and self-reliance. An avid hunter and fisherman, the first pocket knife he ever owned was a Victorinox Swiss Army Knife. Ever since then he has appreciated the value and importance of having a good blade on hand.